Naomi Finley continues to captivate the historical fiction audience with A Guardian of Slaves, the second book in her A Slave of the Shadows series. In 1851, near Charleston, Charles Hendricks dies in a carriage accident. Mr. Hendricks is survived by his daughter Willow, and his estranged brother, Ben. In the year since Charles’ death, Willow has taken on full responsibility of the Livingston Plantation, while Ben is in charge of the import and export business. However, there is another part of the Hendricks legacy to oversee; it is the secret tie that binds them together. The Livingston Plantation is a safe haven for those who seek refuge from the atrocities of slavery. Ben and Willow remain an intricate part of the Underground Railroad; many lives have passed through the family’s hands over the years. When the mysterious Silas Anderson purchases the property next door, tensions rise, especially between Willow and her longtime suitor. Willow and Bowden Armstrong are very much in love; however, love isn’t enough when the value of human life comes between you. A Guardian of Slaves by Naomi Finley wrenches the heart with emotion. The narrative is written using Finley’s love of southern history and her personal life experiences. These two writing devices create inspirational characters within a realistic story. The narrative is written in the first person; however, the point of view changes from character to character. I really enjoyed this technique of writing; it gave an in-depth panoramic view by revealing the thoughts and intentions of different characters. The plot is not forced, nor does it become stagnant and, with a few surprising turns of events, it unfolds with delicate precision. The issue of slavery takes center stage. Held within the man versus man conflict lay witless traditions, confused loyalties, and the horrendous acts against humanity. However, harboring underneath this divergence is a story of love and devotion, proving, whether evil or good, the intentions of the heart make all the difference. Outside the city of Charleston, South Carolina, in 1852, Willow Hendricks managed the Livingston plantation. Willow’s mother had run off many years earlier, and her father had died. Whitney Barry, her best friend, and Ben Hendricks, her uncle, helped in overseeing the large plantation. Although Willow had slaves, she also continued her father’s work in the Underground Railroad. She also loved Bowden Armstrong, but she could not accept his views on slavery. Everything changed when Silas Anderson bought the plantation next to hers. In this historical drama, A Guardian of Slaves: A Slave of the Shadows Book Two, written by Naomi Finley, an intriguing tapestry of life in the South unfolds. Slaves and plantation owners know slaves are disappearing, and credit is given to someone called the Guardian. At the same time, masked bandits are roaming the countryside, creating terror for everyone traveling the roads. A Guardian of Slaves is a captivating story, engaging the reader from the first page to the last. The story includes many characters and details, and yet it moves in a fast-paced, easy to read style. The writing describes plantation life in the 1850s for both the owners and the slaves and it depicts realistic portrayals of the tensions that existed. The personal relationships between owners and slaves reveal a complexity that is often overlooked. Author Naomi Finley has skillfully written an unforgettable novel in A Guardian of Slaves: A Slave of the Shadows Book Two. This book is a must-read for anyone who desires to gain a fuller understanding of this historical era. A Guardian of Slaves is an engrossing work of historical fiction penned by author Naomi Finley, and forms the second book in A Slave of the Shadows series. Our central heroine, Willow Hendricks, is now in charge of the Livingston plantation, which makes it both easier and more challenging as she and her companion Whitney continue their abolitionist mission under the noses of everyone else. Bowden Armstrong, Willow’s beau, tempts her into settling down, but there’s too much work to do and he doesn’t seem all that keen to help her. So when a mysterious saviour is spoken of, a man in the woods helping slaves to be free, Willow’s interest is piqued and tensions are high. This book made me want to go back and explore the opening of the series and the companion works, because Naomi Finley really captures the positive spirit of good people trying to help during one of America’s most divided times. I enjoyed Willow as a relatable heroine, but also a woman a few steps ahead of her time, and felt she was well placed for the era and not too over modernized or glorified. Her mission was humble and she was hard-working, and the amazing twists and mysteries which the plot takes readers on only add to Willow’s inner strength and endurance, and to this excellent reading experience. 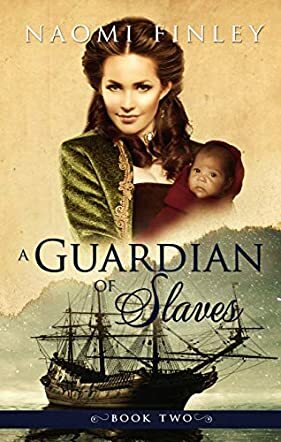 Overall, I’d highly recommend A Guardian of Slaves to all readers looking for a fully formed historical drama, covering not just romance but empowerment, freedom and real life issues that are still relevant today. The main character and heroine of A Guardian of Slaves is Willow Hendricks with help from her friend Whitney Barry. The two women run the Livingston plantation, protecting and befriending the slaves whom they own and are responsible for. Willow is firmly against owning black men and women and believes they should not be considered property. With this in mind, she is known for her kindness and often helps in their escapes. Bowden Armstrong is the man she loves with all her heart but he does not see the slave issue in the same light, thus making it very difficult for them to agree and find a way to marry. There are many others involved in the day to day life of Willow; Mammy, Tillie, her uncle and, of course, a mean bad guy named Silas who has nothing but evil plans. A Guardian of Slaves (A Slave of the Shadows Book 2) is a really memorable book about the old South; their ways, thoughts, ideas and traditions. I really enjoyed A Guardian of Slaves. I did not read book one and while there were a couple of things that I wondered about, the overall story’s enjoyment was not affected in any way. I am now excited to continue finding out the on-going story of Willow, Bowden and the others in the upcoming book three. Author Naomi Finley has a wonderful feel for the historic old days and made it all seem real and jumping off the page. The story is pulled together with a special touch by each of the memorable characters having an important role and a tale to tell. I hope you read A Guardian of Slaves soon because you will not be disappointed. It is a very good book, perfect for fans of historical fiction and drama. A Guardian of Slaves (A Slave of the Shadows Book 2) by Naomi Finley is a historical fiction narrative set in the antebellum era of the American South. As the time period of the book suggests, slavery forms a crucial part of the story. This book is about Willow Hendricks who helps run the Livingston plantation. She and her friend, Whitney, manage to keep up appearances of a successful southern plantation while secretly striving to help blacks escape to freedom and giving them help and support where possible. She loves Bowden but is unsure if marriage with him is the next step for her. In the midst of all this, we also have someone simply called a Guardian, who is known as a champion of blacks and someone to whom they turn to escape the horrors of slavery. How all of this ties together forms the plot of the novel. I enjoyed reading A Guardian of Slaves by Naomi Finley and thought it was a very well-written book. There are a number of supporting characters in this book that really complement the story of Willow herself. Naomi’s vivid and fast-paced writing style brings the era of slavery and life in the American South in those days to life. I felt at times that I was reading eye-witness accounts and diving into the mentality of the people who lived in those times. I especially liked the contrasting personalities of the various women in the book. This is a great historical read set in the plantation and slave-holding days of the previous century.